Terry Brooks is by far my favorite author. I just finished reading his most recent book, The Wards of Faerie. I’m going to make some general comments, then I’m going to talk specifically about The Wards of Faerie with mega spoilers, so if you ever intend on reading some Brook’s books (and I hope you do! ), please skip the end of this post. First, the non-spoiler stuff: I started reading Terry Brooks’ work when I was in Junior High school when I got a copy of The Sword of Shannara from my cousin. 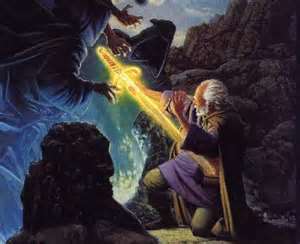 The Sword is a great high-fantasy book in the tradition of Tolkien. Some say it’s too Tolkien, but I think it’s got way too much exciting action to be too Tolkien. Action is one of the aspects of Brooks’ writing that I think makes him the best. No matter how many times the protagonist gets in jams, he makes it out, and I feel surprised they pulled it off. Speaking of surprise, the next aspect of Brooks’ writing that keeps me intensely involved is the mysteries and plot twists. Every book has some secret that the good guys have to uncover and often it is ends in a way I don’t expect. I think I’ve gotten better at anticipating some of the twists over time, but I still get surprised by Brooks all the time. The final and most important aspect of Brooks’ writing that draws me into the story is the characterization. The characters in his books are very well developed and I really end up feeling for them and caring about them. A book just isn’t exciting to me if I’m not rooting for the good guys and cursing the villains. 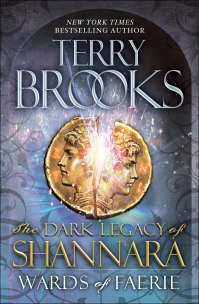 In my humble opinion, no one does this better than Terry Brooks! Now on to the spoilery stuff. You have been warned!! The Wards of Faerie is an intense book! The beginning reading of the diary caught my interest and I absolutely did not want to put the book down once. It’s hard to rank what I liked the best, so I’ll just mention things as I think of them. I was amazed at how the story takes so many concepts from previous books and weaves them all together. It reads like it was part of some plan Terry had 25 years ago, though I’m sure it isn’t. The most touching part to me is the Elcrys, and the approaching demise of Amberle Ellesedil. Even though she hasn’t been a “real character” since her first appearance, I always experience a bit of sadness whenever I think about her or the Elcrys is mentioned. It seems like her reign as Elcrys was rather short. I wonder if it was affected by events such as the elves moving her in the Heritage series or the recent crossing over the Forbidding in High Druid. I’m also convinced that the Elven girl who wrote the diary was the first Elcrys. The Ohmsford twins are an interesting duo, and I didn’t foresee their separation. In fact, the most surprising part was how the group ended up split apart in the end. The advance of science in the World of Shannara is interesting, and the abandonment of Paranor was well done. Finally, I figure the real bad guys in this adventure are probably demons. The Elfstones may have become detectable due to the hole in the Forbidding, and perhaps the diary was planted to be found to lure the Druids from the Elcrys when she’ll need the protection. Well, it looks like this will be another grand adventure, and I’m eagerly anticipating the next installment! Be sure that I’ll be commenting more after I read it! This week I’d like to mention (and promote) the SPACE Anthology 2013 kickstarter. The SPACE anthology is a collection of comics created by artists who will be appearing at the 2013 SPACE convention. SPACE is the Small Press and Alternative Comics Exposition, which is held in Columbus, Ohio every year and features the works of independent cartoonists. A Kickstarter is an online campaign to raise funds to produce a creative project; in this case the funds go to print copies of the SPACE Anthology. The anthology includes my most recent Mutant Elf 8-page strip. I thank anyone for contributing, and/or sharing the link to your friends. If you contribute and receive a copy of the SPACE Anthology be sure to bring it by my table at SPACE so I can sign it for you! I’ll also include something free like a sketch if you mention this post! I’m a Micronauts fan. I loved the toys. I had a Space Glider, Acroyear, and set of 3 Time Travelers, plus the Astro Station. When Marvel released their comic version of the toys, I was immediately hooked. I have, in one form or another, all the Bill Mantlo-written issues of the Marvel Micronauts series. There have been a couple efforts to revive the title by other companies, but these didn’t last long, and I think it was due to writing that just wasn’t good enough. Bill Mantlo isn’t my favorite comic writer, and every storyline in the Micronauts wasn’t great, but he really did some excellent writing over the course of the series. There were many artists who worked on the title with Mantlo. The three that define the book to me are co-creator Michael Golden, Butch Guice who drew Mantlo’s final issues, and Pat Broderick who penciled the return of Baron Karza. The Micronauts was science fiction fun taking place in the Microverse, a sub-atomic realm with lots of planets and human-like and alien beings always involved in one conflict or another. Most of the conflict had to do with fighting Baron Karza. The look of the Microverse was very Kirby-esque, which makes sense because Kirby created the Microverse in the pages of the Fantastic Four and Karza was a bad guy in the Darkseid mold. Though the Micronauts made excursions into the mainstream Marvel Universe, they never seemed to belong there as much as they did running around their home worlds, which included Homeworld. The characters in the comic differed greatly in appearance, and in Acroyear’s case role, than the toys, but they had a chemistry that carries the book. My favorite was Bug, the funny green guy with a big rocket-lance weapon who made “tiks” when he talked. Bug’s usual companions included Acroyear and Marionette (pictures below) and Space Glider.